Please remove Alpha One upper gear housing before shipping us lower unit for repair. An additional $65.00 labor plus handling charge will be applied for units shipped with upper housing attached. Take apart clean, wire brush, sand, zinc chromate primer inside bearing carrier hub, change drive shaft bearing, primer and paint outside area. Install new seal kit and pressure test unit. 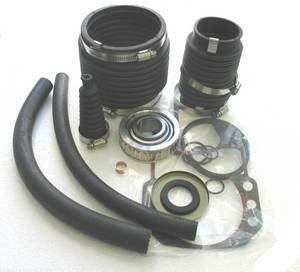 P/N 87510 seal kit for Mercruiser lower units 1970 - 1990 models.